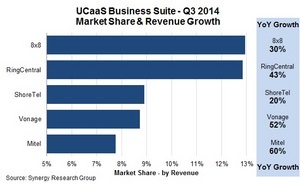 RENO, NV--(Marketwired - Nov 20, 2014) - New Q3 data from Synergy Research Group show that 8x8 and RingCentral continue to lead the UCaaS business suite market, with each having a worldwide market share of just under 13%. However, among the leaders Mitel is growing the fastest with a 60% year-on-year increase in revenue and a more than twofold increase in subscribers. Meanwhile total market revenues keep growing by over 30% year-on-year. OTT UCaaS accounted for 57% of quarterly business suite revenues and private circuit UCaaS accounted for 30%, with the balance coming from hybrid deployments. North America continues to account for over 85% of worldwide revenues due to the under-developed nature of the market in other regions. Currently integrated UCaaS offerings account for just 9% of all managed and hosted business voice subscribers worldwide, leaving significant opportunity for growth. "This is an exciting and disruptive market which is shaking up the old order in enterprise communications, enabling UC to be more broadly adopted in smaller offices and planting the seed for cloud deployments in mid-to-large enterprises," said Synergy Research Group's founder and Chief Analyst Jeremy Duke. "The recent tussle between Mitel and ShoreTel clearly demonstrates how important UCaaS and cloud are to traditional enterprise UC vendors and we expect to see more such activity." Synergy provides quarterly market sizing and segmentation data on cloud UC, UC applications, enterprise voice, telepresence, collaboration technology and related markets, including company revenues by segment and by region. Data is provided via Synergy's uniquely flexible SIA database which enables rapid analysis and provides a range of graphic data presentation options. Synergy Research Group (www.srgresearch.com) helps marketing and strategic decision makers around the world via its syndicated market research and custom consulting. For over a decade, Synergy has been providing unique insights and analytics to marketing, business development, and investment professionals. Synergy is a strategic partner of TeleGeography (www.telegeography.com). To speak to an analyst or to find out more about how to access Synergy's UCaaS market data, please contact Heather Gallo @ hgallo@srgresearch.com or at 775-852-3330 extension 101.